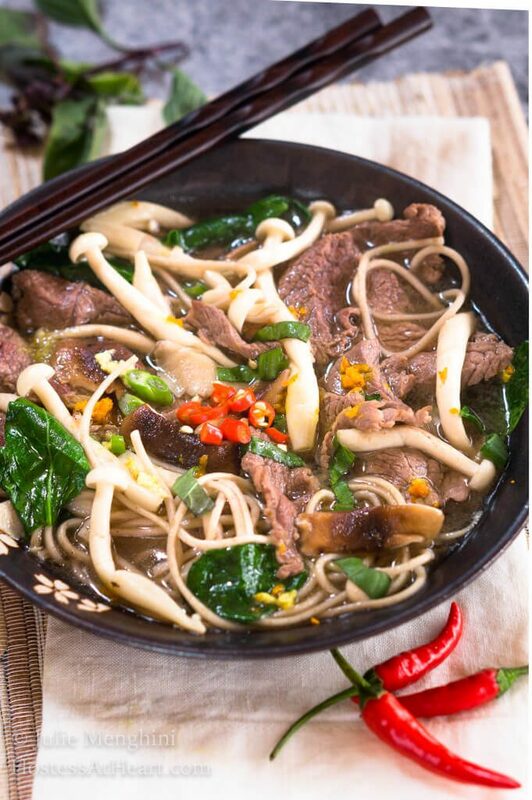 This Spicy Asian Beef Noodle Bowl is a healthy flavor bomb. It’s chock full of good-for-you ingredients and cooks in 6 minutes! We love Asian food. It is so quick and easy to make at home not to mention so much better for you. 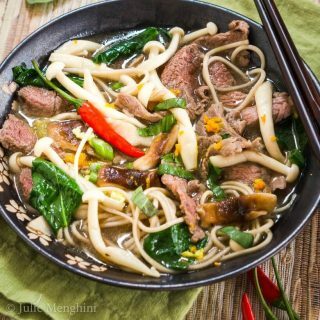 This Spicy Asian Beef Noodle Bowl is rich with deep flavors and it finishes with a punch of heat. When we go out for dinner, we often go for Asian food. You would think with all of those veggies that it would all be healthy right? Well, that’s not always the case. Much of the Asian food you get is loaded with sodium and is often fried in oil. There is a reason it’s delicious but that doesn’t have to be the case. 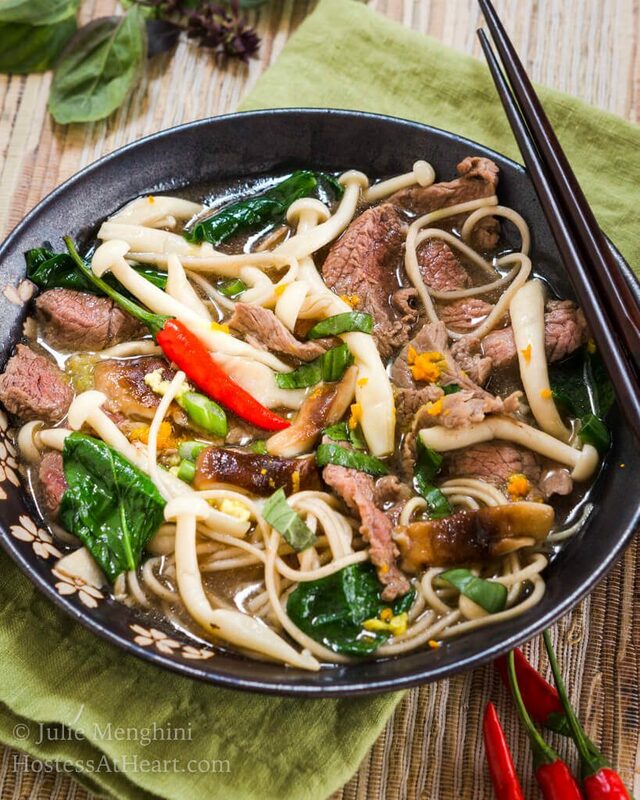 This 6-minute Spicy Asian Beef Noodle Bowl recipe proves it. There are so many flavors and textures in this dish. I made a homemade bone broth which was delicious but I’ve got to be honest. It was expensive and time-consuming. A good quality, low fat, low sodium, beef broth or stock will work just fine. You can also vary the veggies in this bowl. We LOVE mushrooms but I know some of you don’t. Feel free to exchange them with some bell peppers, broccolini, cabbage or another vegetable that tastes great when cooked al dente. 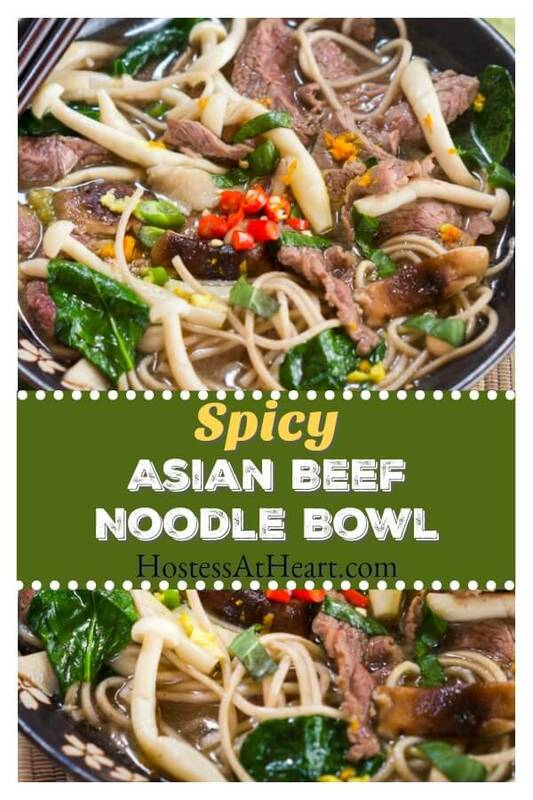 Another great thing about the Asian Beef Noodle Bowl recipe is that it can be as spicy as you want it. As you probably know John like enough spice to knock your socks off. I like a warm finish that doesn’t make me want to drink a gallon of water after each bite. Those Thai chilis pack a lot of heat in their little package. I cook them in the broth and John adds more to his bowl at the end. Both of us remove the seeds! Lastly, this is a NO-GUILT complete meal. The thinly sliced lean sirloin is a great source of protein and soba noodles are made from buckwheat flour that adds fiber. You could definitely make this a vegetarian bowl too. 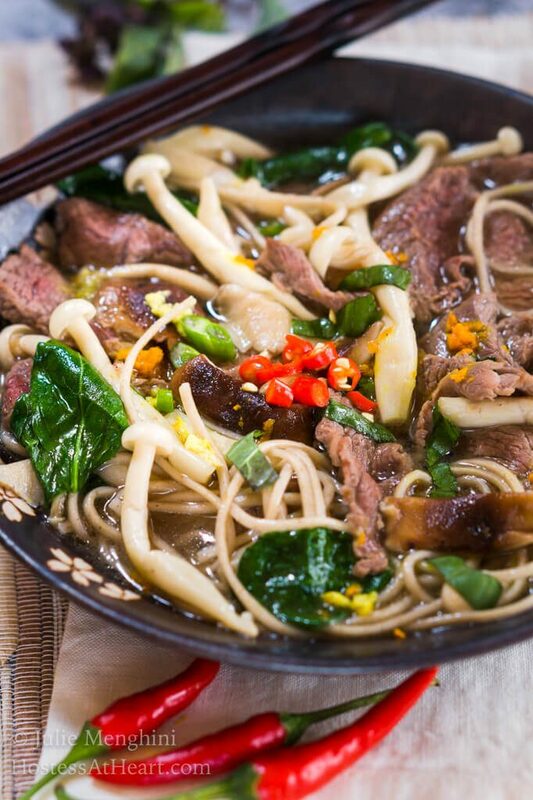 This Spicy Asian Beef Noodle Bowl is a healthy flavor bomb. It's chock full of good-for-you ingredients and cooks in 6 minutes! 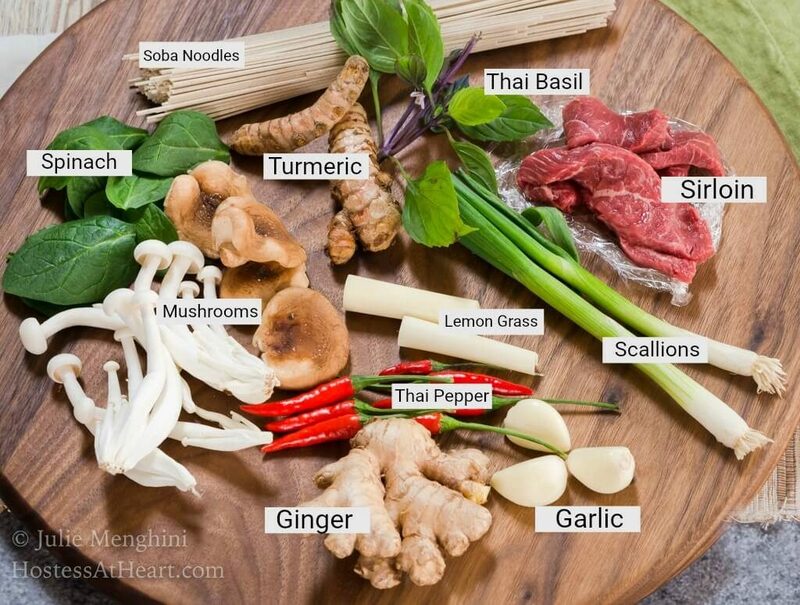 Bring broth to a boil with the lemongrass. 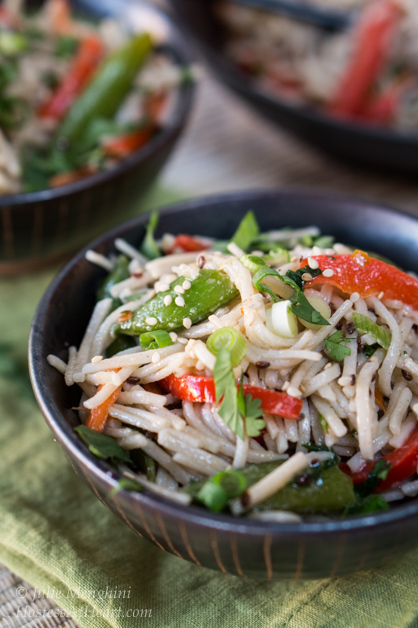 Add soba noodles and cook for 3 to 4 minutes. Remove noodles from the broth and distribute between 4 bowls. Add mushrooms, sirloin, Thai chile pepper and spinach to the broth and cook for 3 minutes. Distribute broth and ingredients between bowls. Sprinkle with grated ginger, turmeric, and garlic. Garnish with scallions and additional Thai chile if desired. I let the soup sit for about 5 minutes before serving. 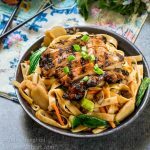 I can’t tell you how amazing this recipe is and here are a couple more Asian inspired recipes that we LOVE! I love anything noodle related! This would be such a huge hit at my house! Thank you Madi! Here too! 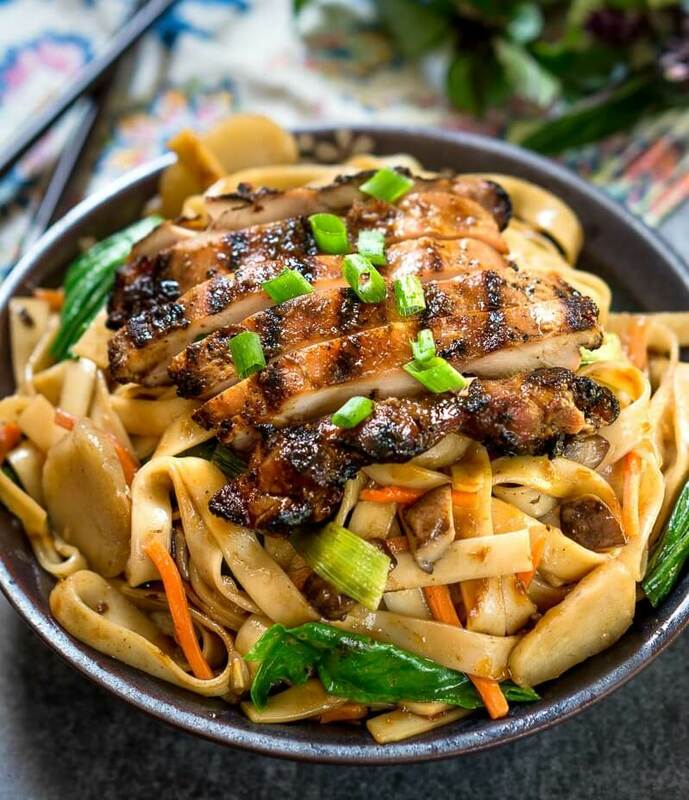 We love Asian food, and this one looks stellar!! Can’t wait to try it! Thank you Michaela! So quick and easy. If I could, I would dive into this bowl and swim! YUM! Thank you, Debbie! We loved this one too. Clean and delicious. Perfect Asian meal!! Hard to believe it’s so simple to make!! Thank you, Michaela! It really is simple to make. Brooks recently introduced to me authentic ramen and now I can’t go back to those instant packets that cost $1 for like 1000 of them. 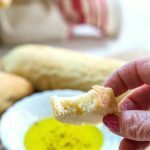 This is great for a weeknight meal when everything is too busy to do! I think those ramen packets make up about 65% of teenagers diets and a 1000% their daily sodium allowance! There isn’t any turning back after you get the real stuff! 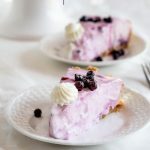 I cant believe how quick I can make this… you make it really easy to cook dinner after a long day of work! I made this for us last night….. Jeff asked if I would please make it again…. cant beat that reaction to dinner!! Thank you, Michele! Yea Jeff so glad you liked it! I can’t believe how quickly this meal comes together. 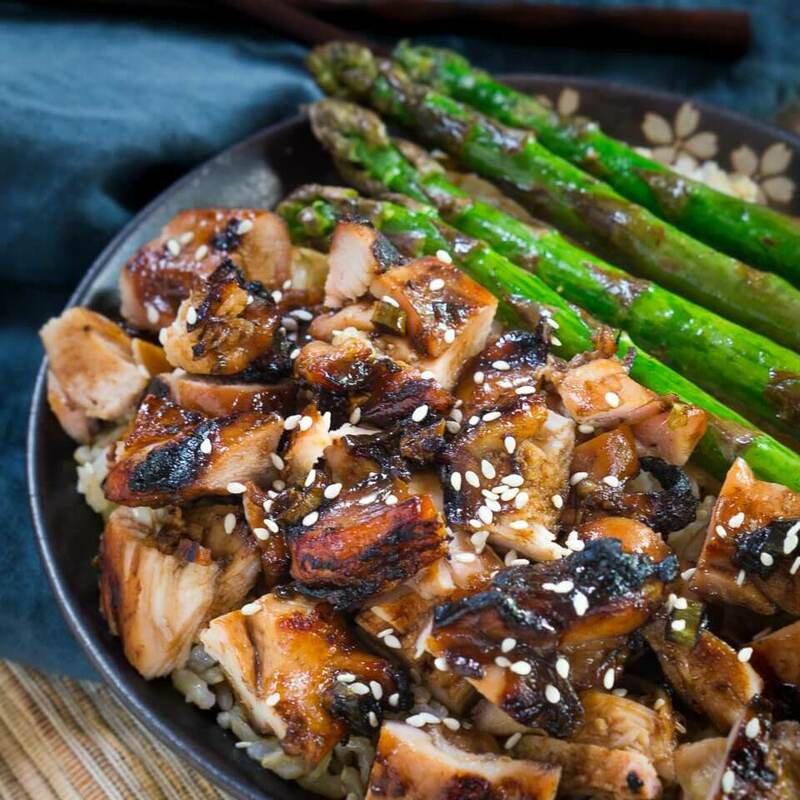 You have all my favorite Asian flavors in one meal – fresh lemon grass tastes amazing, and those mushrooms…swooning over this whole meal! Thank you, Sandra! We are mushroom fanatics and I have to honestly try to cook recipes without them LOL! You sold me with all of these delicious Asian flavors (my fave), then you sold me again with 6 minutes of cooking time! This is sooooo happening! Thank you, Ashlyn! 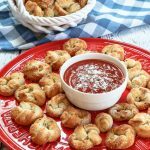 Quick and yummy! Thank you so much, Mollie! Have a great weekend! 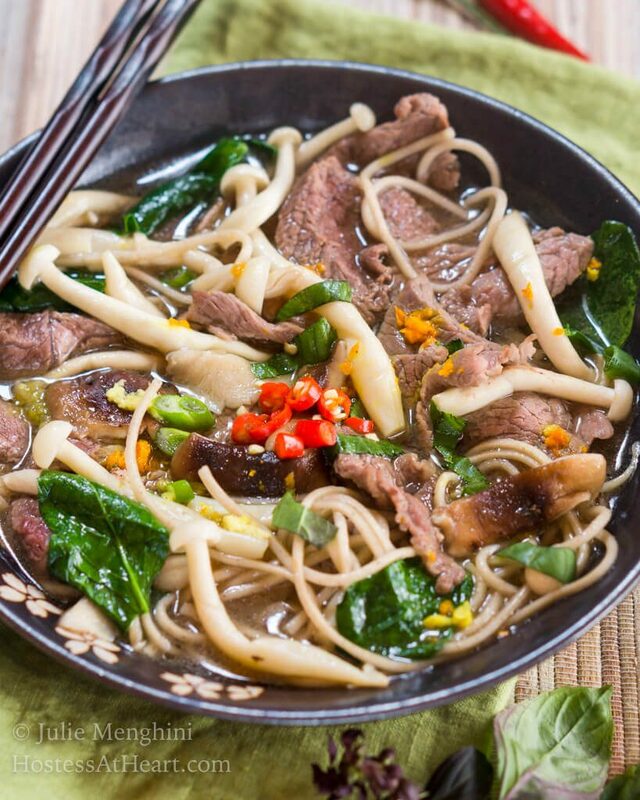 What beautiful colors and flavors in your Spicy Asian Beef Noodle Bowl, Julie. I’d love a bowl right about now. I agree with Mimi, it’s great that you found fresh turmeric. Did you find it hard working with the yellow tint? Did it leave marks anywhere? We used it a lot growing up, but I must confess I have never used the fresh variety. Are you still reeling from all the excitement? So so happy for you. Thank you, Loretta! This was my first time using fresh turmeric and I must admit it took me seconds to grab a paper towel to hang on to it while I grated it. I found it in our Asian store and there was a lot in the package. It’s in the freezer for next time along with those peppers. They sure go a long way and pack a punch. I’m having a ball just watching that little one. She changes every day and her parents are so happy. Beautiful. And it’s so cool that you got your hands on fresh turmeric! Thank you Mimi! Our Asian store always has it. Ever since I walked in there I’ve been able to get it!